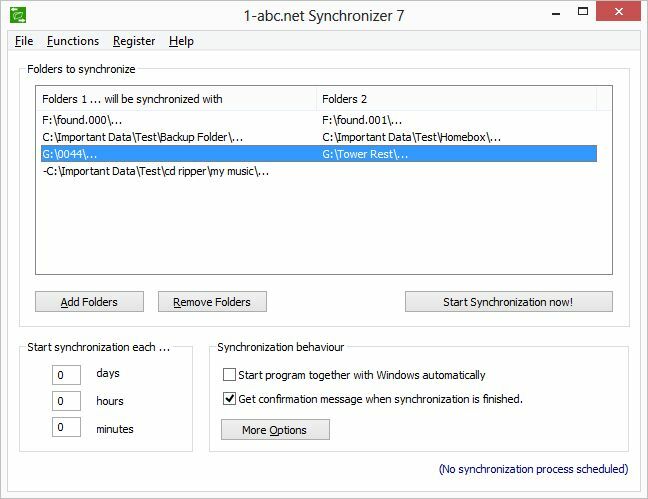 1-abc.net Synchronizer - Synchronize folders scheduled and automatically! Synchronize folders scheduled and automatically! To save data to internal or external hard drives, USB sticks, SD cards and other re-writable media always has one big disadvantage: No user uses the same path and later he finds out that a folder he once created for security backups was used to change files while the content of an original source folder was not modified anymore. Others copy documents to a USB stick, make changes to the file and forget to overwrite it later on their local computer. Or they save a file on a network drive to allow other users to make changes but do not remind themselves to update the file for their own local use before they edit the data again. 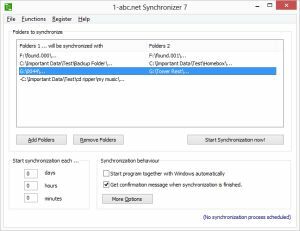 1-abc.net Synchronizer is able to compare folders, detecting new files as well as modified ones and always saves the latest versions to both folders. Now you do not have to care about having the current data anymore. You can start a synchronization manually or configure the program in a way that it does this job for you scheduled and automatically! Program can also read from and write to SD cards, USB sticks, external drives etc.